The European commission told a meeting of interior ministers in Luxembourg that more had to be done at the EU level to control mass immigration, legal and illegal. Reacting specifically to the Lampedusa boat sinking in Italian waters between Tunisia and Malta, Cecilia Malmström, the commissioner for interior affairs, called for an EU rescue mission spanning the entire Mediterranean. The project would be entrusted to Frontex, the EU's borders agency, with the aim of tracking, identifying and if need be rescuing boatloads of migrants leaving north Africa for southern Europe. Malmström said the project should stretch from Spain to Cyprus. 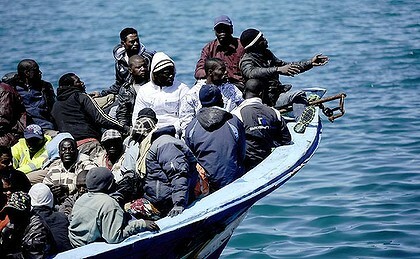 It was not stated if the proposed patrols would also be used to chase boats back to where they came from. But EU interior ministers from the 28 governments showed little inclination to respond to the Lampedusa tragedy or to the Syrian refugee crisis by agreeing a more open or generous policy. Italy is clamouring for greater solidarity from other EU states in trying to cope with the number of migrants coming across the Mediterranean. Migrants still held on the island protested on Tuesday about conditions at the camp, throwing mattresses over the fence of the centre and trying to block departing buses.